The North Coast grape harvest is kicking into high gear at the same time warmer weather has hastened the ripening of the estimated $1 billion crop. After a cool spell in August, conditions are shaping up for a busy but ideal harvest, according to Sonoma County Winegrowers. The cooler stretch and lingering morning fogs help concentrate the flavors in the grapes. “And now to get a little heat with overall ripening of the fruits is about as good as it can get,” said Karissa Kruse, president of SCW, the marketing and educational organization representing 1,800 growers around the region. After an early start to the harvest, Kruse said things are almost back to a normal schedule for this time of year. So far, an estimated 15 to 20 percent of the crop has been harvested in Sonoma County. Now, it’s full speed ahead for many growers. “The next three weeks are going to be very busy and very compressed in my estimation. It will kick things into pandemonium,” said Joe Reynoso, who expects to harvest 700 tons in his Alexander Valley vineyards. He finished harvesting 200 tons of whites over the weekend — chardonnay and sauvignon blanc — and is moving on Friday to the reds — cabernet, zinfandel and syrah. Reynoso grows grapes in Asti, one of the warmer spots in the county, so he started harvesting earlier than most growers — Aug. 22 — and tends to finish earlier. But other are also ramping up. After a much smaller North Coast crop in 2015 — 400,489 tons — that followed three massive crops, indications are that this year will come closer to the historical average, according to Kruse. 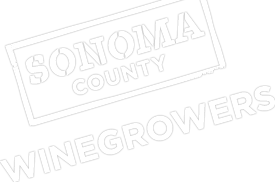 The past decade’s crops have averaged almost 463,000 tons annually among Sonoma, Napa, Lake and Medocino counties, but that same period corresponded with an increase in acreage. Napa County growers also are optimistic. Rainfall patterns and quantity this year have helped, along with the right combination of hot and cool stretches. “The drought definitely played a role in the light harvest in 2015,” Kruse said, adding that “nice, steady rainfall this past winter” allowed more saturation of the soil that benefited the roots. Micro climates and grape varietals dictate the rate of harvest, but she said 85 percent of the crop should be in the tank by mid to late October. Closer to the cooling influence of the coast, vintner Eric Flanagan said “we’ve actually done quite a bit of picking” and is about halfway through his pinot and chardonnay harvest. He estimated the 31-acre Platt Ranch near Bodega, in which he has an ownership stake, will produce a bigger yield this year than last — 70 tons versus 43 tons in 2015 — but “not as good as a good year” of about 100 tons. Flanagan is enthusiastic about quality, however. Coastal pinot grapes tend to have lower sugar and alcohol levels, a subtlety prized by aficionados. The two weeks of foggy, cool weather in August will make that even more so, according to Flanagan. People enjoy coastal pinots for their classic fruit profiles, Flanagan said, and “this year, coastal pinot noir will be especially coastal.